Is Fibromyalgia Becoming A Pain In Your Pocketbook? Simple and Extremely Effective Ways to End Fibromyalgia Symptoms without Drugs by clicking the image below. " width="150" height="150" />It is estimated that fibromyalgia patients spend up to $1,000 per month in addition to their insurance according to a 2007 study by National Fibromyalgia Association. Fibromyalgia costs the U.S. between 12-14 billion dollars each year, and a 1-2% loss of the nation’s overall productivity. Fibromyalgia is a common but complex pain disorder affecting over 5 million people in the United States. This chronic pain affects the person physically, mentally and socially. It is characterized by pain all over the body that are very tender often described as stabbing, shooting, achy, throbbing or twitching. Numbness, tingling and burning also add to discomfort. Sometimes the pain is completely unbearable and worse in the mornings. Most people who suffer from fibromyalgia have a tough time sleeping and never really feel energized even after hours and hours of sleep from the pain all over their body. Symptoms can come and go but severe episodes can be really bad and interfere with normal daily activities. There are many other associated symptoms like irritable bowel, headaches, migraines, and impaired memory. How Is Fibromyalgia Commonly Treated? Pain management is generally how FM is treated. There are a number of drugs commonly prescribed including pregabalin, duloxetine and milnacipran. Sleep management, psychological support and other treatments like physical therapy, massage and yoga can be beneficial. However, one of the most important factors to improving these horrible symptoms is the recognition of the need of increased adaptation through an optimized nervous system with upper cervical care. 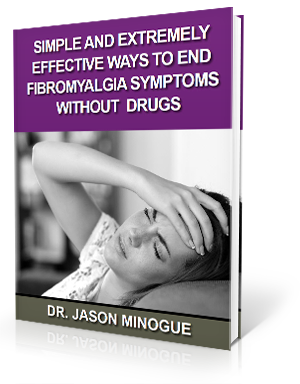 To learn more about the connection between head and neck injuries and fibromyalgia or chronic fatigue syndrome download our complimentary e-book Simple and Extremely Effective Ways to End Fibromyalgia Symptoms without Drugs by clicking the image below. How Can Upper Cervical Care Help Fibromyalgia? Pressure on the brain stem located in the upper cervical spine could be the reason fibromyalgia-like symptoms are occurring. The upper cervical spine is located at the top of the neck and is very rich in nerves that run to the entire body. Upper cervical chiropractors are trained to analyze and detect if there is a dysfunction in this area. A misalignment in this sensitive part of the spine could be the missing component in living a life pain and symptom-free. National Fibromyalgia Association. About Fibromyalgia. http://www.fmaware.org/about-fibromyalgia (accessed 18 June 2015). Soriano W, Apatiga A.. Resolution of Fibromyalgia & Polypharmacy Concomitant with Increased Cervical Curve & Improved Quality of Life Following Reduction of Upper Cervical Subluxation: A Case Study. J. Upper Cervical Chiropractic Research 2014; 2014(4): 61-67.